Practice Area: Driving range with grass tees, putting green, chipping green with sand bunker. 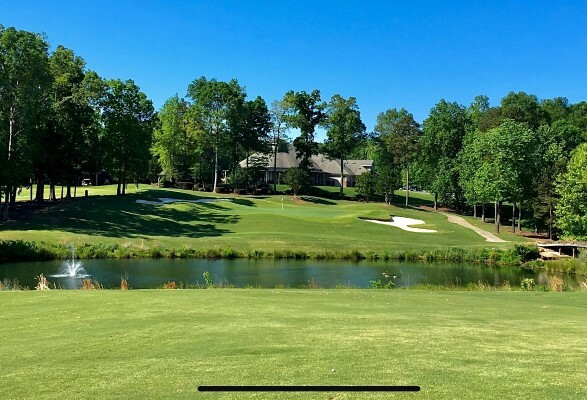 Description: Located in Mint Hill off Hwy 218, this semi-private club offers a very challenging layout with strategically placed bunkers, several ponds, and typically slick greens. Notes: Course offers membership deals and is a great place for a golf outing. B-Man's Take: This has become one of my favorite courses in the area. 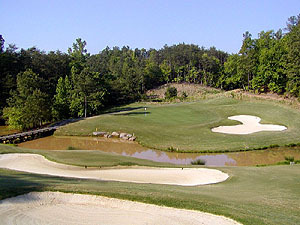 It is kept in great shape from tee to green, with some of the nicest white sand bunkers around town. This course will also test your range, as you'll likely need every club in the bag. There are many holes where you'll want to use something other than driver off the tee. My favorite holes: the two par 5's that bookend the round -- the 517yd birdie-able first hole and the likewise birdie-able 528yd finishing hole. Hell-holes: too many to list, but look out for the two-tiered green on the par 3 fourth and the trouble-laden par 4 10th hole. I suggest finding a member and playing under the guest rate, since this is otherwise a pricey round of golf. Discount Specials - Discount coupons you can print and take to the course to get dollars off your round before you go.